Spring harvest from big arbor trees around 100y old processed in Huang Cao Ba village. Flower with honey notes scent comes out from gaiwan and tea leafs start to give flavored liqueur within first infusion. Very nice Shen Jin sweetness along with pleasant hui gan . Hand pressed / rolled into the balls sheng pu-erh varies in weight from 6 to 10g. Вложите в корзину чтобы увидеть бонусные баллы. 69 .. . 69 . . CNY 3.45. 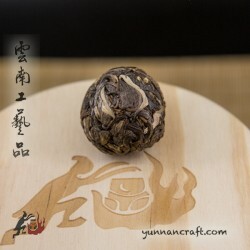 Hand pressed / rolled into the balls sheng pu-erh varies in weight from 8 to 12g. Tea can be sold in loose form per pcs. or in the gift box 3pcs. Other variations of gift boxes in Packing & Wrapping section.